The Nanny Joynt is so happy to share a wonderful full time nanny position available with one sweet infant girl! Their sweet little daughter was born on New Year’s Day is such a great baby. These new parents are warm and inviting and are looking for a long term nanny to grow with their family. 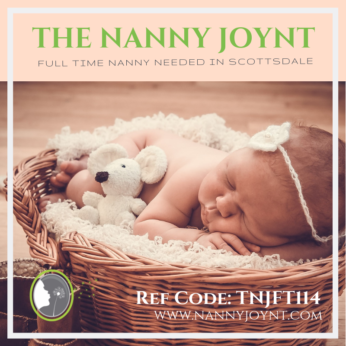 This family is seeking a nanny who is friendly, personable, experienced and hard working to join their family to help care for their sweet baby girl. Both Mom and Dad work outside of the home, however, Dad will sometimes stop in during the day. Mom and Dad are both medical professionals and can sometimes run late by about 15 or 20 minutes if they are seeing patients. No holiday or weekend care will be needed at this time. This position is offering $16 – $19 per hour with paid holidays, paid sick days and guaranteed hours! This family is open to outings when their baby is a little older and will also pay mileage. They live right near Fashion Square Mall so there is tons to do. This sweet family is looking for a nanny who is extremely gentle, safety conscious and loving. They want their little girl to be loved on and really cared for. The nanny should have newborn/infant experience and be a go with the flow type person. Their little one is not on a schedule as of yet and they are feeding on demand. They plan to implement Taking Cara Babies sleep routine as the baby gets older. A nanny who is knowledgeable with Taking Cara Babies would be great! This family would love to find a nanny who bilingual in another language, however, this is not a requirement for this position. They want their nanny to be loving, attentive, hands-on, laid back, calm, patient, organized, self driven & motivated. The ideal nanny for this family is someone who is experienced with infants, is passionate about children and her career in the childcare field, nurturing, proactive and is adaptable. Mom loves for the home to be clean, tidy and organized, so a nanny who has these same beliefs is ideal. Someone who loves their career as a nanny and genuinely enjoys spending time with their precious little girl. Their perfect nanny enjoys helping their little one reach her developmental milestones and actively engages the baby throughout the day. They prefer a nanny who is active, healthy and will effectively communicate the days activities with them and also keep a daily log. Child related duties will include overall care of the baby including but not limited to: feeding, diapering, naps, keeping a daily written log, helping baby hit each developmental milestone, tummy time, playing/reading, singing and walks. Cleaning up after self and baby, washing all bottles, baby laundry, maintaining the nursery and baby food prep when needed. Household responsibilities will include cleaning up, load/unload dishwasher, wiping counters and other surfaces, vacuuming, family laundry, errands if needed and simple meal prep for the family. Keeping the home neat, orderly and clean is very important to this family. They do employ a house cleaning service who comes twice a month for deep cleaning of the home. Mom is highly allergic to cats and would prefer their new nanny not own any pets of her own. Bringing cat hair into the house can be detrimental to her and cause her allergies to flare up quickly. This family is easy going, communicative and looking to find a great fit for their family. They are looking for an extension of themselves – someone that enjoys their little ones company and caring for her as much as they do. Ideally this person will become an extension of their family as they are looking for someone to be present for years to come as both of their families live out of state. This is their first child and finding the right fit is very important to them! This is a wonderful opportunity for a nanny who is seeking a position with a loving and caring family! They want their nanny to feel valued and appreciated. They are fun and easy going and are excited to meet a wonderful nanny to join them in helping out with their baby girl!